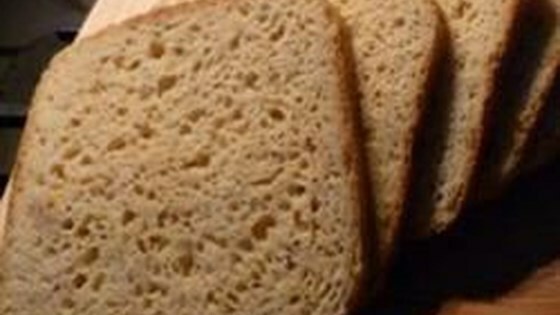 "Make this gluten-free bread in your bread maker. It's not as good as normal bread, but it's pretty good if you must avoid gluten. The mixture will look more like cake batter than bread dough in your machine, don't worry, it will be okay. The loaf may sink while it's baking, leaving a crusty, crunchy bowl on the exposed end, which you will want to slice off and discard. The finished bread will be quite firm and heavy, and I recommend slicing it thin. It makes good toast, but it toasts slowly. I use my darkest toaster setting and have to run that twice to get golden brown toast." Place water, eggs, oil, vinegar, flour, xanthan gum, salt, sugar, and yeast, in that order, in a bread machine. Run Basic cycle and select Light or Medium for the crust. Remove when cycle ends. Cool completely before slicing. It was pretty good, for GF. It was very easy so I'll make it again.